Mysterious funk group Here Come the Mummies recently wrapped a filmed concert at the historic War Memorial Auditorium on October 4 with lighting provided by Bandit Lites. Comprised of ultra-talented but super secretive members, HCTM has grown into a cult sensation over the last five years. Jake Tickle provided the light to bring the band the bold, saturated colors using GRN Moving Washes, VL 3000s, GRN Pars, GRN Washes and Pixelline 1044s. The biggest challenge for Tickle was the design of War Memorial Auditorium, which includes a curved upstage wall and only two rigging points upstage, limiting the design to a generic upstage truss. Early on the band decided that they liked the look of the pillow wall, which takes light very well, from all angles. Due to the limits on truss weight we had to light the entire pillow wall from the floor, but the results were fantastic. Another less obvious challenge came in the form of not wanting to light the musicians too well. Due to the fact that their identities are a secret (rumored to be because they don’t want to be in breach of contract with their other, mainstream music gigs) Tickle had to use very little front light. However, since this was a live DVD shoot, Pixel Lines and an array of conventional fixtures at various angles were used for key light. 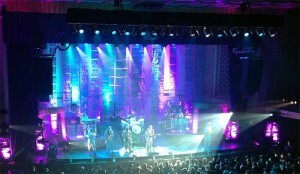 Not surprisingly, the band is known for its gimmicks on stage, and Tickle worked to mimic that in the lighting design. "Over the years, we continue to add various LED items throughout the stage and instruments," said Tickle. "A variety of props were constructed specifically for this shoot and we added RGB LED tape throughout. We first started using RGB LED tape when they decided to switch to the vintage Ludwig Vista Lite Drum Kit. Each of the eight drums is individually controlled via the console, which enables us to do some great chases and wipes inside the drums." Additional equipment includes the Chauvet Geyser and a recently purchased High End Road Hog 4 console. "This was a very easy transition from the High End IPC they had been using for the last few years," Tickle said. "The Road Hog 4 is the perfect fit, and the DVD shoot was its maiden voyage for the band." Tickle credits the support he received from both the crew at Bandit and HCTM for making the shoot a success. "Bandit Lites client representative Brent Barrett is always a joy to work with, and he has been assisting Here Come the Mummies since they started carrying lighting," said Tickle. "Bandit Lites has a great staff in house, and each player is very supportive and always willing to assist. Special thanks to Don Lockridge, Matt King and Mark Steinwachs. This was my first time working with crew chief Ty Veneziano and he was superb. We kept making changes the day of the shoot and he made them all happen with ease. Here come the Mummies brought in Eugene O’Conner as the director of photography. He has been shooting live concerts for a very long time and was a true pleasure to work with. Shawn Worlow who has been the band’s tour manager for a few years now was quintessential in making the shoot happen."